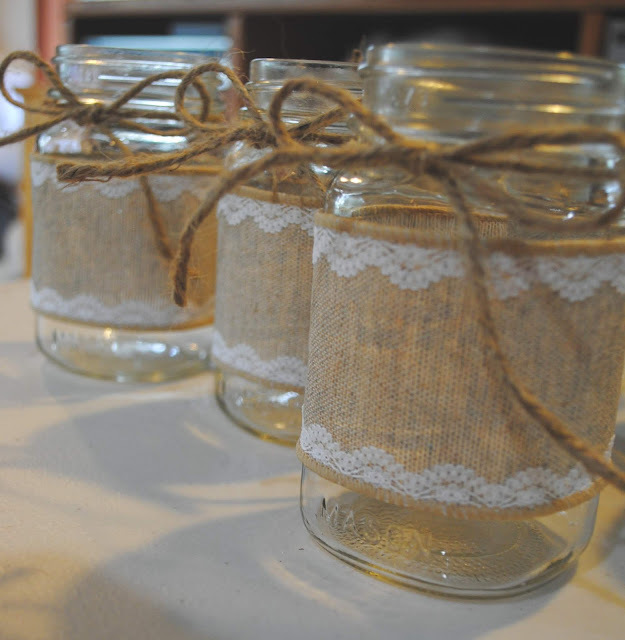 Mason Jars- In or Out for Weddings? I was talking to a wedding planner about my July bride and what she wanted for her reception table centerpieces. Mason jars, wood rounds, flowers, some wood hearts with their initials burned into them. The planner said, I hope you tried to talk her out of the Mason jars and into using something else. 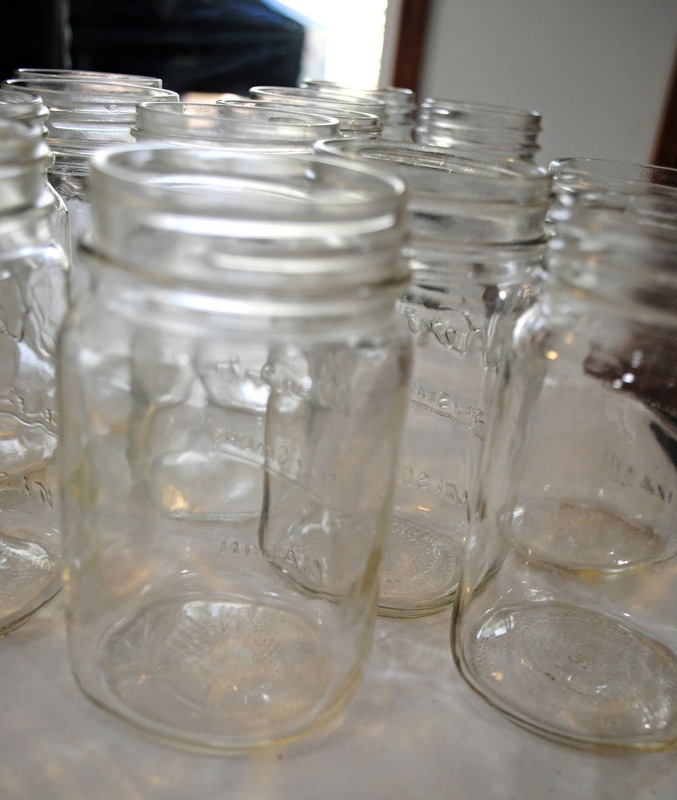 I understood what the planner meant, Mason jars have been overdone and are out as far as trends are concerned. I didn't try and talk my bride into something else for a few reasons. The couple is in their early twenties, graduating college and buying a house. When it comes to their wedding they're on a budget and both feel like while the wedding day is important, it's just one day out of the rest of their lives together. They'd rather focus on and spend their money on their new house and making it a home together. I love all these reasons for why this couple is having the wedding that they are. The most touching reason why I didn't try and talk the bride into using something else was because these Mason jars were her grandma's. The brides grandma canned a lot and every holiday her grandma's canned green beans would make an appearance on the table. Sadly, her grandma is no longer with her. By using her grandma's Mason jar's as part of her reception table centerpieces, she's honoring her grandma. One of the services I offer as a wedding consultant is wedding crafting. The couples I specialize in are all about DIY'ing their wedding. And my July bride is definitely DIY'ing as much as she can. We met at her house along with some of her family, gathered all the supplies we would need and started crafting. 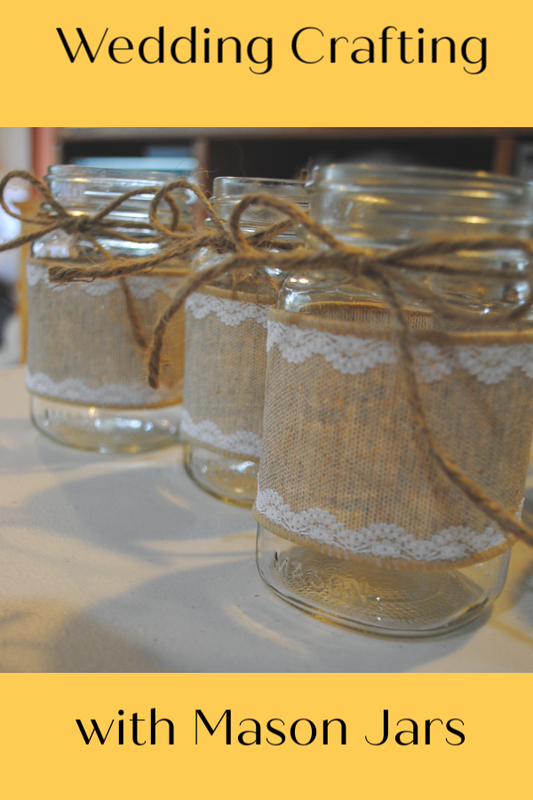 The bride wanted the burlap and lace ribbon wrapped around the jar and a jute bow around the top. We got started by measuring how much ribbon we'd need to go around the jar and hot glued the ribbon in place. With 5 of us working on it we completed this part pretty quickly. 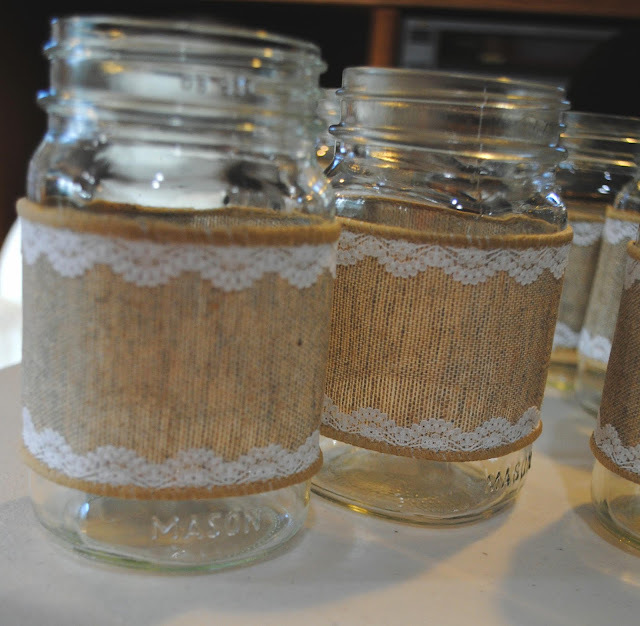 After hot gluing the ribbon onto the Mason jars we cut the jute into strips and tied bows at the top of the jars. The bride was really happy with how they turned out. Her brother is going to cut some wood rounds for her that she'll set these jars on. Gerbera daisies, babies breath and some greens will fill the jars. Along with the Mason jars on the wood rounds will be little wood hearts with the couples initials burned into them. Another crafting day may be in the works to make the little hearts. This would be fun since I've never used a wood burning tool before. 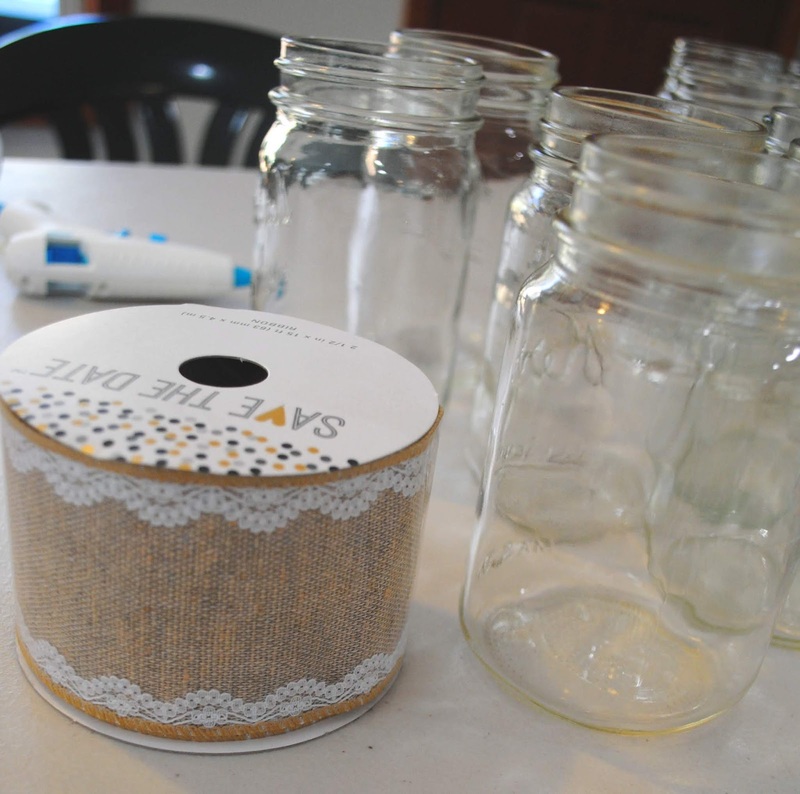 You want to DIY as much of your wedding as you can. Which means you're going to be crafting. What happens if you have to do A LOT of crafting? Or only a few of your friends are willing to help and you really need another pair of hands? Or maybe you have enough friends to help you craft everything but you just don't have time to gather all the supplies? Or maybe you have enough friends, have all the supplies and you want to host a little party for your friends because they're helping but you just don't have the time? All of these reasons is why I have a wedding crafting service. I can be your extra pair of hands that you need. I can pick up all the supplies you need and deliver them to you. I can set up a little party for you and your friends to enjoy while you're crafting.